Marlene! Congrats, and thanks for entering. Your awesome prize will be on its way to your mailbox shortly. Enjoy, and thanks again for checking us out at TV Screener.com! Gotta be honest … I’m not into the Kim Kardashian wedding this weekend (though you can watch it all unfold on E! in October if you are). 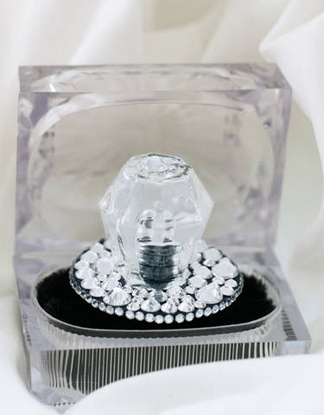 But the Ring Pop people are acknowledging that it’s probably the biggest celebrity wedding to hit Hollywood for the forseeable future, and in honor of that, they’ve created some very special Swarovski crystal-covered Ring Pops. Yep, it’s real candy (no, you shouldn’t eat it), clear-colored, to mock a diamond, and the Ring Pop is covered with little Swarovskis all around the base. Cool, right? The Ring Pop peeps made a similar candy concoction to honor the marriage of Prince William and Princess Catherine earlier this year (the Royal Wedding Pop was blue instead), and now an American celeb wedding has gotten the same nod. The best part: you can win one of the rings! Good luck, Ring Pop fans! I was obsessed with ‘My Big Fat Obnoxious Fiance,’ so that’s definitely my favorite! show! Very touching and very genuine.